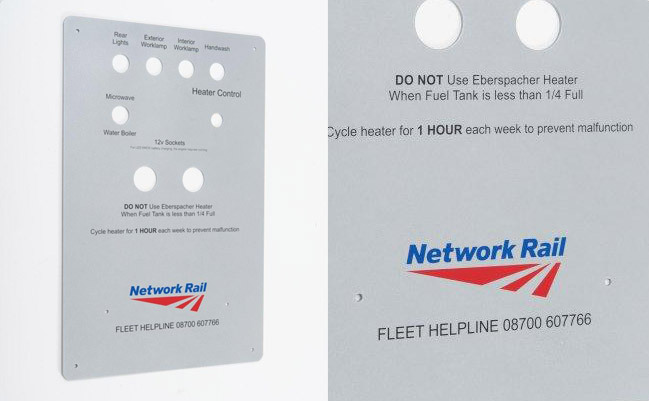 We were approached by Network Rail; the brief was to design a series of robust panels and labels about 50 designs in total ranging from first aid, heating control, welding instructions, fuse ratings, battery guard, tool station labels and various control panels to replace the existing ones currently being used in their converted site vehicles in which the engineers worked and lived for days at a time and sometimes weeks. The current labels were being produced in house using outdated printing methods, such as label writers and dot matrix printers, they found the labels to be poor quality, they were dropping off, they were easily damaged, they were untidy and looked cheap, also the adhesive they were using was poor quality and not suited to the environment. As for the control panels these were being made from ink jet printer A4 laminated paper stuck at the side of the controller, not ideal and definitely not safe working practice. From a range of samples provided by the customer we came up with a series of labels made from under surface printed matt/velvet polycarbonate, the labels were fitted with a strong self-adhesive using either a 3m or a VHB so were suitable for smooth and uneven surfaces, the labels were then die cut to size so that there were no visible cutting marks. The labels were printed and stepped up in such a way that the die cutter produced a complete set of labels in one hit therefore reducing set up times and so in turn keeping costs down. Matt/velvet polycarbonate was the preferred choice to produce the labels in, as it’s ideal for indoor and outdoor use, this was crucial because some of the labels were fitted to the exterior of the vehicles, the other benefits of using this material, it’s flexible, the print is protected from wear as its under surface printed, the surface is abrasion and mark resistant, they are easily wiped cleaned and are hygienic. The control panels were made from 2 mm thick anodised aluminium, the panels were punched in house using our CNC cad-cam equipment, they were then cut to size, cornered and deburred before being stove enamelled in silver to match the cabinet they were being fitted to, the text and logo were screen printed onto the surface of the paint and then the panel had one final stove to harden the print to the surface. The customer was over the moon with the final result and has since been back to Watsons many times over for repeat orders and for new business.